Black Pearl is a 100% natural hair care range designed specifically for natural hair. 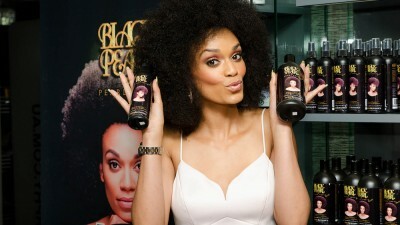 It was actually created through a partnership between Pearl Thusi and Ntombenhle Khathwane (who owns Afro Botanics). It’s also not too badly priced Choma. Check out the range you can purchase at Clicks stores here. Earthy started out as a hair care range and was started by a woman from Soweto named Mummy Mthembu-Fawkes. Earthy now includes other products for your face and body. The products usually range from about R55 to R350 (for combos) and have been getting a lot of great reviews. You can shop online for products at Earthy’s website here. Connie Ferguson has released a range of body lotions that are extremely affordable - less than R20 at clicks. Some people who have used it say how much they love the scent and feel of the lotions. You can view the Clicks store range here. Malia Nail Care is a nail polish line founded by a young entrepreneur named Lebo Mphela. A huge focus for the brand is nail care and that’s why, according to Lebo, the nail polish doesn’t contain any toxic chemicals and is meant to stay on longer while keeping your nails stronger. The website is down for maintenance but you can send a Facebook message here to check where you can buy the nail polish and for how much (the last price was R50). Estella Cosmetics is a beauty range that sells matte lipstick and lipgloss as well as make up brushes. It was started by two young women named Naledi Sibisi and Salia Labo. To order from them you have to email them: estellacosmeticsns@gmail.com or checkout their Instagram page to view their range. These are just a few local brands that are made by South African women for South African women. Do you know of any more local, women-owned beauty brands that should be on the list? Please let me know in the comments section below. Always remember that you are naturally beautiful Choma!